The league games of the Indian Super League 2015 are over and Goa have finished atop the standings with a tally of 25 points from their 14 games. Goa won as many games as Atletico Kolkata and Chennaiyin FC – the teams lying second and third respectively, but importantly, they lost the fewest number of games than any other team – only three. Goa were second last term after the league games, and lost narrowly to eventual champions Atletico Kolkata in the semi-finals to bow out of the competition. However, they look stronger this term and have the wherewithal to go all the way and take the title from the West Bengal outfit. Crucially, Goa are not dependent on a standout forward to get their goals, while Reinaldo Da Cruz Oliveira has scored seven times, Mandar Rao Desai, Jonatan Lucca, Macpherlin Dudu Omagbemi and Thongkhosiem Haokip have scored three goals each, highlighting that their opponents cannot subdue the side by marking one player out of the game. Goa are strong favourites to take home the title this season. Stiven Mendoza of Chennayin FC is leading the scoring charts with 11 strikes, while Atletico Madrid’s Iain Hume is lagging one behind with ten. Mendoza has netted five goals in his last four outings, whilst Hume has really gathered steam after a slow start and has been on the scoresheet in his last five games, netting seven strikes including a hat-trick. Much to the delight of Atletico Kolkata faithful, their striker is hitting his stride at just the right time. The West Bengal club and Goa FC will face each other in the last four ensuring that one of Hume and Mendoza will play one extra game than the other. And my prediction is Hume will edge out Mendoza for the top scoring honours. There have been several players with a legitimate shout for being the best player at the current edition of the ISL, and Steven Mendoza is at the forefront. 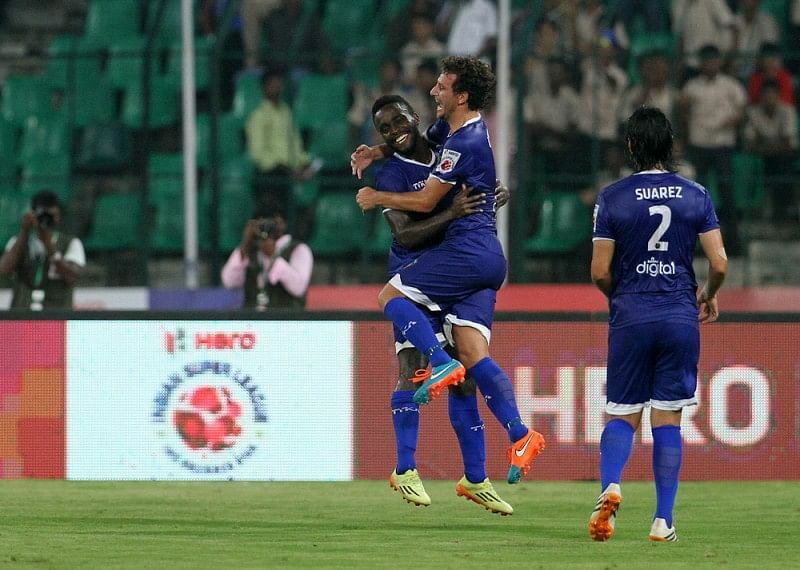 The FC Goa striker has netted 11 goals to lead his side to the last four, where they will face Delhi Dynamos. The forward also leads the chart for maximum number of shots on target with 31. And if his heroics lead Goa to the summit clash and ultimately to the title, he will surely ink his name on the best player gong.